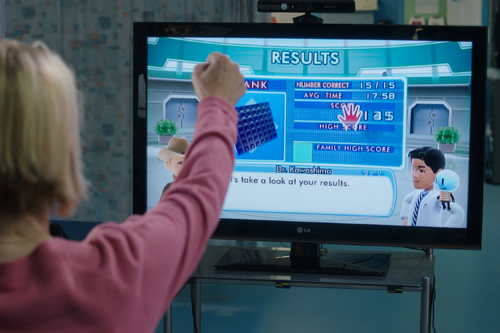 Explorations of the health potential of Microsoft's Kinect gaming system have so far tended to focus on how it could be used to help rehabilitate patients. But a new study suggests the Kinect could make a major impact in telemedicine, potentially cutting healthcare costs and reducing patients' hospital visits – and consequently the associated risk of infection. The study's headline claims focus on the cost-saving benefits of the Kinect, which uses sensors to track body movements and register voice commands, but the technology could have wider-reaching benefits over existing telemedicine systems. Writing in the International Journal of Electronic Finance, University of Arkansas' Janet Bailey and Microsoft's Bradley Jensen said gaming technology could be used to "teleport" the knowledge and skills of healthcare workers to where they are needed. "The Kinect allows doctors to control the system without breaking the sterile field via hand gestures and voice commands with a goal of reducing the direct cost of healthcare associated infections to hospitals and patients," they wrote. The team says they have has demonstrated that their Kinect system, known as Collaboration and Annotation of Medical Images (CAMI) works even where only low-bandwidth and unreliable connectivity is available. But they acknowledge that the use of the Kinect in this way is "not anticipated to be a panacea to the telemedicine environment, but it is a powerful tool that can be affordable in virtually any community that has existing technology and communication infrastructure". In their paper, 'Telementoring: using the Kinect and Microsoft Azure to save lives', the authors suggest that a laptop, a $150 Kinect, a connection to Microsoft's Azure cloud computing platform, and an Office 365 account, all costing a few hundred dollars could replace or augment existing telemedicine systems that cost upwards of $25,000. Microsoft will be hoping that the Kinect's ability to allow doctors to control the system without breaking the sterile field, via hand gestures and voice commands, will give it another edge by reducing the direct cost of healthcare associated infections to hospitals and patients. In the US, these currently cost up to $33.8bn each year. Other healthcare applications of Kinect being trialled include its use as a stroke recovery tool by a UK university and in physical therapy and rehabilitation by a Canadian medical start-up.